These materials are also available in 12 foot lengths. Please call to arrange a freight line delivery. Ask about quantity discounts. 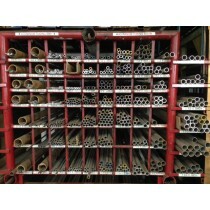 Al 6061-T6 Cold Drawn Seamless Tube .312" X .058" X 48"
Al 6061-T6 Cold Drawn Seamless Tube .312" X .035" X 60"
Al 6061-T6 Cold Drawn Seamless Tube .312" X .035" X 48"
Al 6061-T6 Cold Drawn Seamless Tube .312" X .049" X 90"
Al 6061-T6 Cold Drawn Seamless Tube .312" X .049" X 60"
Al 6061-T6 Cold Drawn Seamless Tube .312" X .049" X 48"
Al 6061-T6 Cold Drawn Seamless Tube .312" X .049" X 36"
Al 6061-T6 Cold Drawn Seamless Tube .312" X .058" X 90"
Al 6061-T6 Cold Drawn Seamless Tube .312" X .058" X 60"
Al 6061-T6 Cold Drawn Seamless Tube .312" X .035" X 90"
Alloy 304 Welded Stainless Steel 180 Grit Polished Square Tube - 1 1/4" x 1 1/4" x .065" x 48"
4130 - Chromoly Round Tube 1 3/4" X .083" X 90"
4130 - Chromoly Round Tube 1" X .065" X 90"
Alloy 304 Stainless Steel Rectangle Tube - 1" x 3" x .065" x 60"
Aluminum Flat Bar 6061-T6511 - 3/8" X 2" X 72"